U.S. Sen. Daniel Inouye and Irene Hirano attend a campaign rally for Hillary Clinton at Ryan's Grill at Ward Center. Instead of spending this weekend at the state Democratic Party convention, U.S. Sen. Daniel Inouye is on his honeymoon. 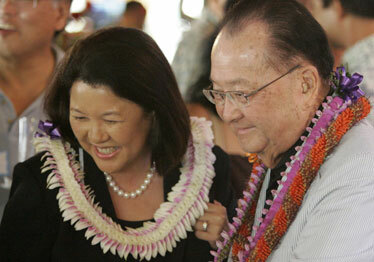 Hawaii's senior senator got married yesterday to Irene Hirano in a small private ceremony in Beverly Hills, Calif. The 83-year-old Inouye, dressed in a dark suit, and Hirano, who dressed in white, were wed at All Saints' Episcopal Church, and then left for Carmel, Calif., for their honeymoon, according to a news release issued by the senator's office. Inouye's son, Ken, was best man, and Jennifer Hirano served as her mother's maid of honor. The wedding ceremony was limited to the immediate families. Irene Hirano is president and chief executive officer of the Japanese American National Museum in Los Angeles. "This is a glorious day for both Irene and I, as we start a new chapter in our lives," the senator was quoted as saying in the news release. "Our work keeps us quite busy, but the time we spend together and even our chats on the phone give a special richness to our lives," he said. "I am most fortunate to have as my partner a beautiful, accomplished, intelligent and worldly woman." Inouye's wife of nearly 60 years, Margaret, died in 2006 of complications from cancer.